I love finding Keto and low-carb desserts I can eat without guilt. 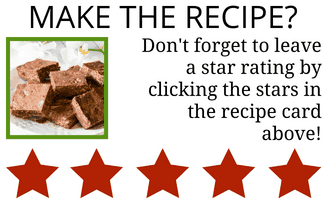 Often I’ve tried recipes only to make them and have them be dry, crumbly, or not taste like a dessert at all. This Cream Cheese Pound Cake is Heaven. It’s so soft and creamy and is delicious regardless of whether or not you’re doing Keto. I guarantee if you brought this to a get-together, or served it to people and didn’t tell them it was Keto or low-carb, they would never know. It’s that good. I love, love, love pound cake. I mean, let’s be honest, I love ALL cake, but pound cake holds a special place in my heart and tummy. Buttery, dense, sweet, creamy, and just….luscious. I really wanted a low carb pound cake but for some reason, I was intimidated by turning this into a Cream Cheese Pound Cake recipe. Then I had to do it for my Keto Fat Bombs, Sweets, and Treats cookbook anyway and I thought, well, really, how hard could this be? Actually not that hard at all. 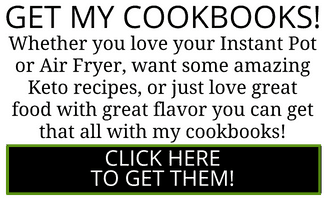 But wait, first let’s talk about this cookbook! 100+ recipes that are low carb, and just delicious. If you haven’t ordered it yet, go check it out! 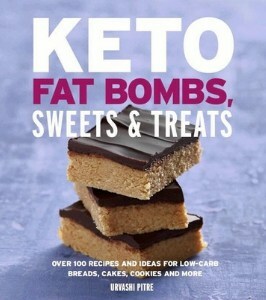 Here’s the link to the best keto desserts cookbook you will ever find. Can I freeze this Cream Cheese Pound Cake? Why yes, yes you can. This low carb pound cake is so dense (in a good way!) and buttery tasting, that it actually freezes extremely well. 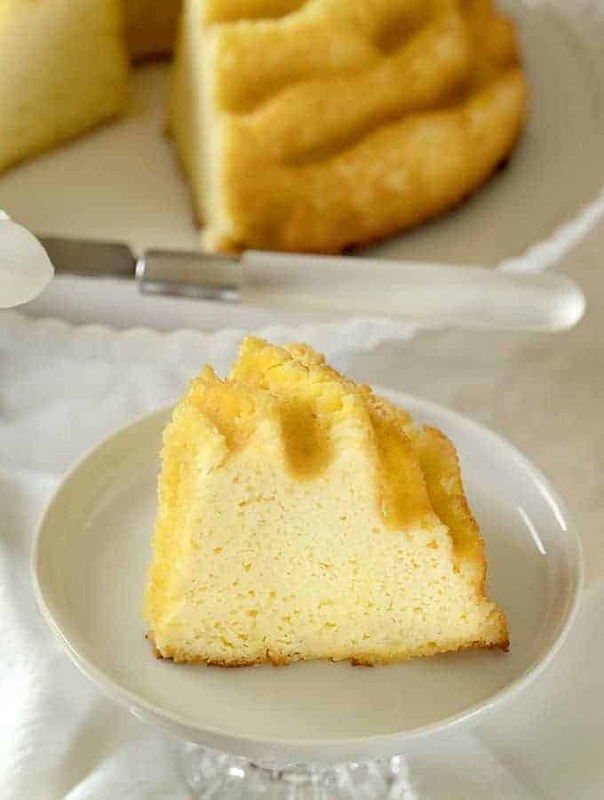 I’d suggest you cut up slices and freeze individual slices of this Cream Cheese Pound Cake so you can have a) portion control but b) near-instant gratification when you just MUST have a piece of keto cake. I mean honestly, this will be the best Cream Cheese Pound Cake you’ve ever had. If it’s not, send it to me, and I will gladly eat it! CAN I SUB COCONUT FLOUR FOR THE ALMOND FLOUR? No. These two are not interchangeable. 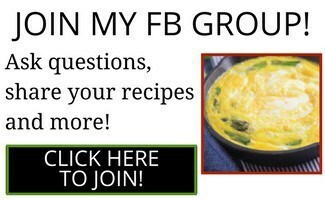 I always have people ask me this for recipes, so I’m answering the question before you even have a chance to ask. If you only have coconut flour, get almond flour too because it makes so many amazing recipes and I use it often. This recipe makes 8 very generous servings. You can make it in a loaf pan, but you may need two loaf pans. You can use any leftovers for strawberry or raspberry shortcake with lots of whipped cream. If you want some pizzazz added to the recipe, you can also vary flavors by using lemon extract and 1 tablespoon of lemon rind for lemon pound cake, add some cinnamon and nutmeg for spice cake, and the list goes on. 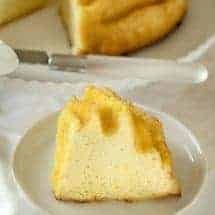 Think of this Cream Cheese Pound Cake recipe as not just a pound cake, but also as a base cake recipe you can change to suit your needs. It can be quite versatile. LOOKING FOR MORE DELICIOUS LOW CARB CAKE RECIPES? CHECK OUT MY GLUTEN-FREE NUT-FREE KETO CHOCOLATE CAKE! This Cream Cheese Pound Cake is deceptively low carb and oh so delicious! Pound cake so good your non-Keto friends will never know the difference! Preheat oven to 350 degrees. Grease a 6-cup bundt pan and set aside. In a large stand-up mixer bowl using the paddle attachment on the mixer, beat together the butter, cream cheese and Swerve until light and fluffy and well incorporated. Add the eggs and sour cream and mix well. Add all the dry ingredients until well combined. Beat the mixture until it is light and fluffy. Pour the batter into the greased bundt pan. Bake for 40 minutes until a toothpick inserted to the bottom of it comes clean. 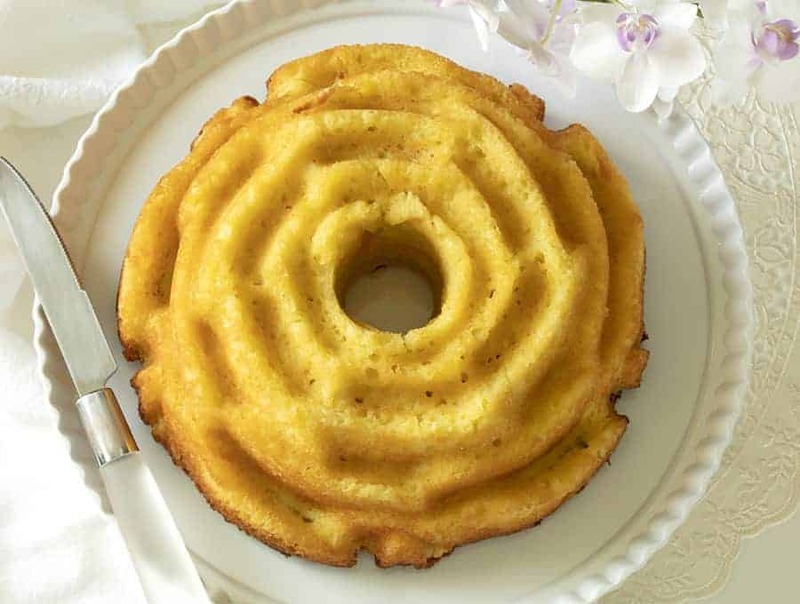 Please be sure to a) beat the heck out of the batter and b) Use a SIX cup bundt pan, not the huge, 10-12 cup pans that are standard. I followed the recipe exactly and the cake didn’t rise much and also tasted awful. It wasn’t buttery, sweet, it was just nutty from the almond flour. IDK what went wrong, but it was terrible. I’m thinking I’ll make this then cut it up to make a Keto trifle! Thank you for this amazing recipe. Does this go in a standard bundt pan or MAYBE I can use the silicone pan that I made your Chocolate Mini Cakes in! Ok, it fit perfectly in my 6 cup bundt pan. In this pound cake can we use Erythritol for Swerve? so Swerve IS Erythritol that has been altered with an agent that makes it measure at a 1:1 ratio for sugar so it’s easy to bake with it. I don’t know what the ratio of regular Erythritol to Swerve would be – and the lack of that agent that makes Swerve measure 1:1 will change the consistency of the batter a bit.